HACKETTSTOWN, N.J. -- In the winter of everyone’s discontent, it was, of course, below freezing outside, but Todd Brusberg was checking the rows of baby Parris Island, Royal Oak Leaf and Firecracker lettuce thriving in the 70-degree temperature and 100-percent humidity of a new $100,000 hydroponic greenhouse here. Mr. Brusberg, a former technology consultant who experienced memory loss after surgery on a cerebral aneurysm, is one of 37 trainees in three New Jersey greenhouses tending a riot of vegetables and herbs; they are the vanguard of a $800,000 program with national ambitions. 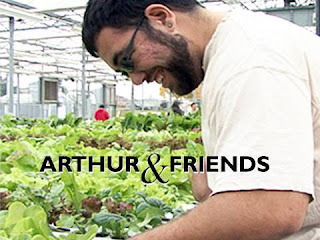 The project, called Arthur & Friends, trains developmentally disabled workers to grow pristine, sustainable produce for restaurants and farmers’ markets. About 200 people have been educated in the art of dirtless farming, and more are waiting to learn. He added that he hopes to restart his business, but meanwhile is “trying to prove to myself that I can still do what I did before, and hoping to use my own expertise in technology in the hydroponic greenhouse,” particularly the facility’s electronic control systems. They monitor temperature, humidity and the flow of nutrients that enable plants to thrive without soil, pesticides or herbicides. Mr. Brusberg’s colleagues in the greenhouses include men and women who have dealt with autism, cerebral palsy, strokes, traumatic brain injury, Huntington’s disease and severe bipolar disorder. The program calls the trainees “friends” because “they aren’t really clients or consumers, and since many are older, they don’t really answer to the word ‘student,’ ” said Wendie Blanchard, the nonprofit project’s founder and program director. The first friend in the program was Mrs. Blanchard’s nephew, Arthur Blanchard, 33, who was born with Down syndrome. When he told his aunt how bored he was, toiling in a sheltered workshop popping dog treats like pigs’ ears into plastic bags for five hours a day, they began discussing how he might find a more rewarding job. The program has received more than 100 inquiries from organizations in New Jersey and across the country, including Detroit; Birmingham, Ala.; Jackson, Wyo. ; and Kealakekua, Hawaii. Also kicking the tires have been the William J. Clinton Foundation and representatives of Jon Bon Jovi, who sponsors affordable housing for AIDS patients in Newark. Sir Richard Branson, who is constructing a Virgin Spa in Peapack, checked out the greenhouse in Sussex County, at the New Jersey State Fair Grounds in Augusta, last year. Over the last four months, revenues from each greenhouse has averaged $1,500 a week, “which is profitable,” Mrs. Blanchard said. Profits are reinvested. The program has applied for grants to establish greenhouses at veterans’ hospitals for disabled military personnel and hopes to establish greenhouses at schools to train developmentally disabled students and to teach healthy eating. And along with the greenhouse here and the one in Sussex County, there is the Arthur & Friends Urban Greenhouse and Training Center in Orange, in more densely populated Essex County. “I thought it would also be perfect for urban areas, where there are so many unemployed people, especially ex-offenders and disabled veterans,” said Lorraine Gibbons, coordinator of the year-old, 1,800-square-foot Orange greenhouse, which has trained 10 ex-offenders, two of them veterans. “The idea is to keep the entire cycle in the urban community, growing food in the neighborhoods, distributing it there and selling it there.” The operation has sold to Gramercy Tavern in Manhattan, along with New Jersey restaurants and a farmer’s market in Newark. The greenhouses grow an assortment of greens including Claytonia, dandelions, basil, arugula, kale, Tuscan kale, curly red Russian kale, cilantro, mizuna, tak soi, bok choy and Swiss chard. The program provides restaurants with seed catalogs, encouraging them to place custom-blend orders. Participants work 8 to 20 hours a week in a four-tier, 200-hour program that trains them in hydroponic agriculture and also teaches invoicing, ordering, shipping, conducting online sales and interacting with customers. People with disabilities “have long been excluded from the workforce, and have been given jobs to keep people busy — repetitive manual labor or janitorial duties,” said Elaine E. Katz, vice president of grant programs at the Kessler Foundation, which gave $48,162 to establish the Sussex County greenhouse in 2008 and $500,000 more in 2009 to expand the project to Hackettstown and other sites. The project is unusual, she said, because it is potentially profitable and provides jobs with the possibility of advancement. When graduates are hired in the program’s greenhouses, their hourly pay rate can range from $7.45 to $13, depending on their responsibilities. Graduates receive assistance in finding employment at the estimated 184 greenhouses in the five-county area of the Northwest New Jersey Community Action Program, the project’s original sponsor. The project is not entirely a garden of Eden. The greenhouses are expensive to start. Federal grants, which helped create the first greenhouse, are threatened in next year’s budget. There is a long waiting list for training slots and jobs. And the program had to navigate a two-year learning curve in formulating a training and growing schedule, as managers experimented with crops to entice chefs, and calibrated the proper balance of hydroponic nutrients in water. But now, Arthur & Friends is licensing its program for $10,000 a greenhouse, selling other organizations its hard-won know-how. Rutgers University has paid for advice on a planned greenhouse, and a nonprofit group in Portland, Ore., has agreed to do so. As the program has grown, so have the workers. On a recent afternoon, Mr. Brusberg was demonstrating the technique of running a pizza cutter along seeded rows of baby All Star lettuce mix, to separate the plants. “I’m open to where this takes me,” he said.